Ideally one starts an ongoing series with volume one … but sometimes life is not ideal. 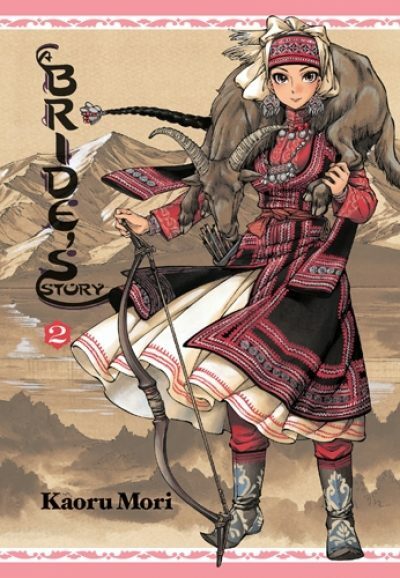 What I actually have on hand is volume two of Kaoru Mori’s manga series A Bride’s Story, so that’s where I began. First published in 2010 as 乙嫁語りor Otoyomegatari, the English language translated version was released only a year later. In the previous volume, Amir, a young woman of a nomadic Turkic tribe roaming somewhere near the Caspian sea, was married to Karluk, whose people are sedentary. As was customary for this time and place, the marriage is not a love match but a political alliance. The marriage forms a bridge between the two communities. Neither the bride nor the groom had much say in the arrangement. Nevertheless, Amir and Karluk seem compatible enough. With time and effort, they should be able to forge a solid family. Amir is of course a newcomer to her husband’s people. She knew none of the locals before she was given in marriage to Karluk and many details of life in a fixed settlement are new to her. Happily, it does not take too long for her to find a friend in unconventional Pariya. Pariya is as yet unmarried, and may stay so for some time. Her parents are searching for a groom, but her outspoken and frank nature is not attractive to prospective in-laws. Amir will have none of this and neither will her husband, Karluk. With her birth family determined to carry Amir off and her new family and their fellow town dwellers determined to keep her where she is, violent conflict seems inevitable. Faced with this conflict, Amir will have to choose between her husband and her birth family. Even when the struggle between the nomads and townies is most fraught, the two sides do their best to avoid lethal violence. Partly this is because whatever their short term disagreements, the two sides probably don’t want the sort of irrevocable break a murder would cause. Partly this is because the series doesn’t seem to be all that interested in violence. Which is not to say there are no dark moments. When Amir is out of earshot, her relatives will admit that one of the brides previously sent to the Numaji was kicked to death. Amir is lucky to have avoided that fate. Now her luck may have run out. The needs of her tribe come before the needs of any of its members, especially the women. But the book has few such grim asides. Most of the story is an engaging look at life in this region of Central Asia in the 19 century, an account told mainly from Amir’s point of view. Rather conveniently for infodumping, the town hosts a visitor who is far more foreign than Amir. Mr. Smith is a British scholar making a study of the region. Coming from a distant and alien land, he is just the sort of person who wants detailed explanations of what is what. Although this region forms part of the playing field for the Great Game between Russia and Britain , Smith seems to be exactly what he claims to be and not a covert agent for the Crown. Good luck convincing the Russians of that in future volumes, Mr. Smith. Smith also is quick thinking enough to foil the first attempt to kidnap Amir. He stampedes a herd of sheep at the would-be kidnappers while apologizing profusely to the enraged shepherd. In the process, he not only saves Amir but prevents her relatives from giving in to their urge to simplify the problem by killing Karluk. Mori’s art shows what aspect of the story matters most to her: the illustrations of the occasional fights aren’t nearly as detailed as her illustrations of the townie tapestries. Such tapestries form the accumulated wealth of the town women, as well as embodying generations of family history. Occasional dark moments aside, this was an interesting change of pace for me. The author focused on the cultures of the communities involved, not on the intercommunal violence. I’m definitely going to track down volume one of this series, as well as any other works by Mori that may be available. A Bride’s Story 2 is available from Yen Press.